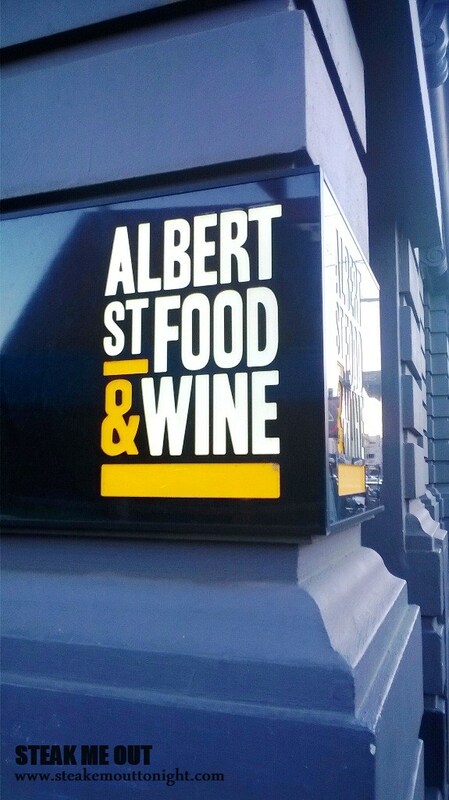 I’ve wanted to go to Albert St food and Wine since forever. I think the menu has changed four times since I first put it on my list; and I finally found a willing party to accompany me to the restaurant. As we went to give our orders the waiter let us know that the wait between entrée’s and mains would be a significant one, but we weren’t too fazed and proceeded to place our orders. I went with the Foie gras parfait with toasted brioche and pear & ginger chutney ($23), while my friend went with the entrée special, tuna sashimi salad (don’t remember the price) while for the main we opted to share the Sutton Grange Beef Tomahawk for 2 (800g) cooked medium rare with cheesy chips and ‘butch relish’ ($84). The entrees were rather quick out, the foie looked good with a large serving (always a plus) while the tuna sashimi was vibrant and struck me as very fresh. After breaking the layer of fat on top of the foie gras I dug in. It was delicious: lusciously creamy and thick, but still light enough that the big serving wasn’t too much. 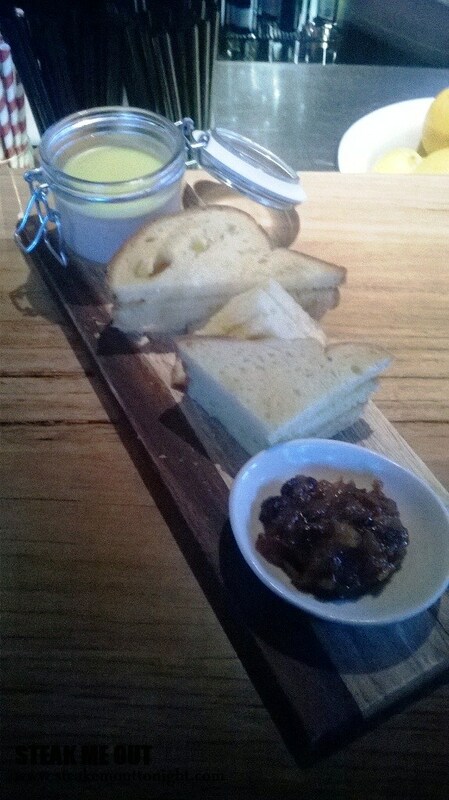 A perfect balance; the fruit “spread” was also great. It was rather chunky, which added depth and texture to the dish instead of it being just a plain spread without much zest. 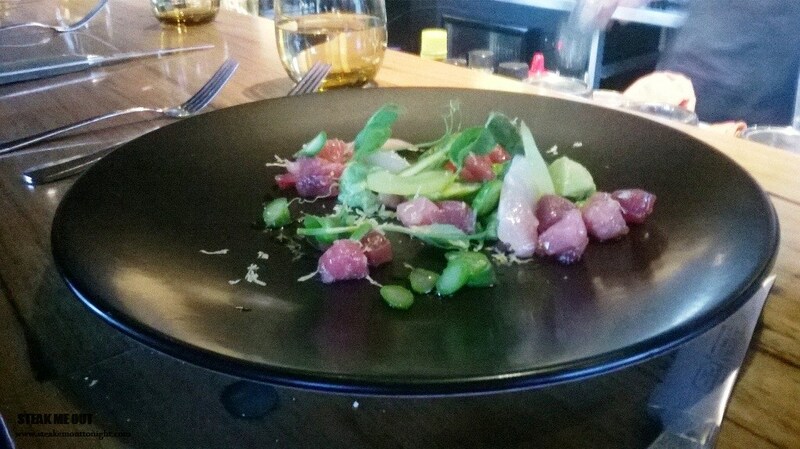 I only had a bite of the tuna but from what I tried the freshness of the ingredients and quality of the fish really shone through. 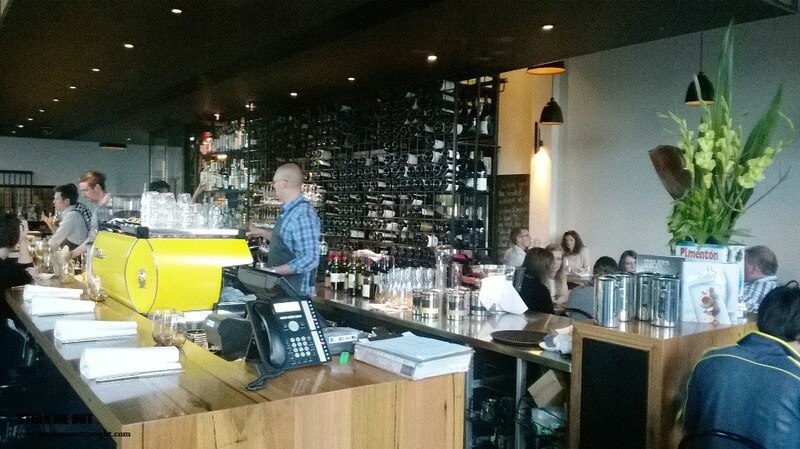 Despite being fully warned, the wait between the entrée and main felt like (and was) eons. Finally we were given steak knives and warm plates (winning) in anticipation of the steaks arrival. When it arrived I knew it was going to be good. It looked picturesque, the presentation was fantastic and it had a charred, fatty aroma rising from it. It was cooked to a perfect medium rare the whole way through, and the flavour of the beef was heavy, smokey and fatty which coupled with the mustard was marvellous. It however lacked tenderness and took a fair amount of cutting of the pieces to which there was no “melt in your mouth” factor. The chips were more like chunks covered in cheese which were nice (could have been fluffier) but I felt like the cheese was unnecessary and the butch sauce was a house made sweet spicy tomato relish. 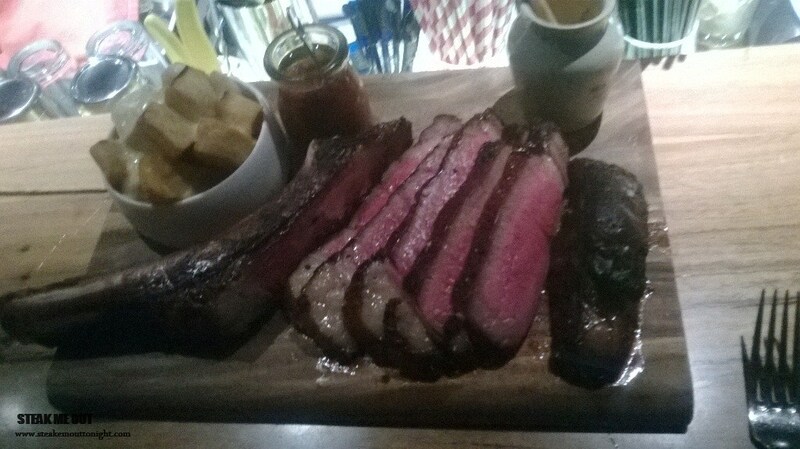 I was curious to know how it was cooked, whether by grill, long grilling, oven or a combination of the two, and the waiter was kind enough to find out for me that it was sealed at high heat on the grill then finished in the oven in a pan of its own juices. 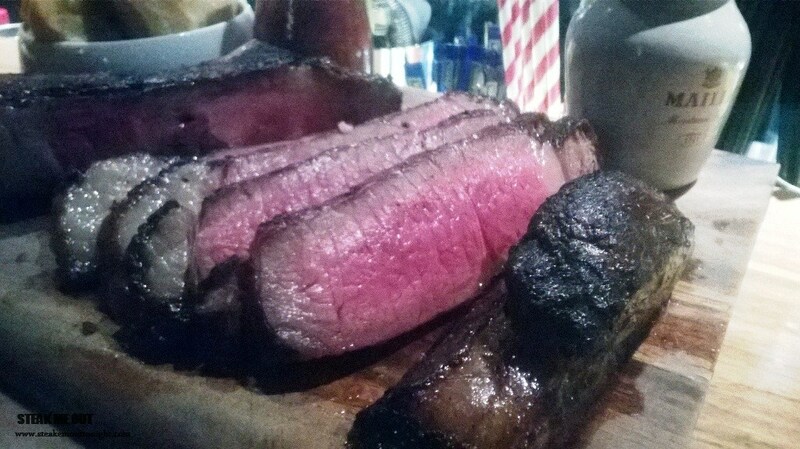 The steak at Albert St food and Wine is a good’un, only lacking in tenderness. But, now that Chef Philippa Sibley is leaving, who knows how long it will be on the menu for. 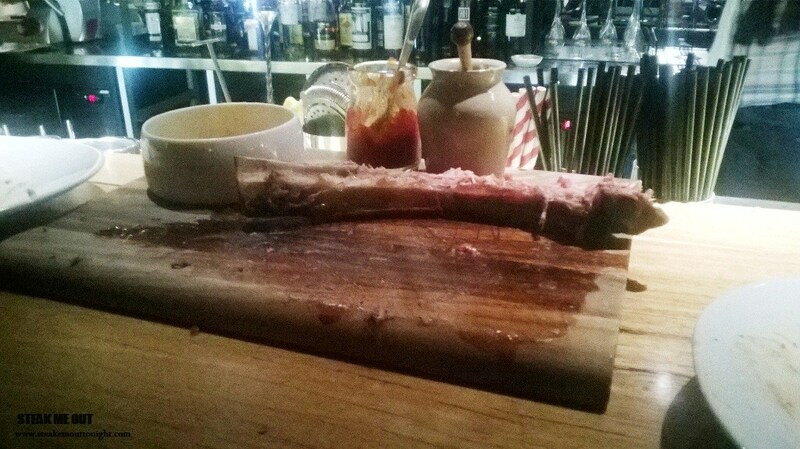 Posted on December 15, 2013 October 13, 2015 by AdrielPosted in Melbourne, SteakTagged Brunswick, Melbourne, Rib Eye, Steaks, Tomahawk. Spoke to the staff about the chef leaving and apparently the chef taking over the role is already head chef and has been part of the team right from day one. Philipa was executive chef. They said the menu will still be the same but with some new additions from the new head chef, who is still the head chef if that makes sence….anyway have always had nothing but good experiences when ever I’ve gone there!